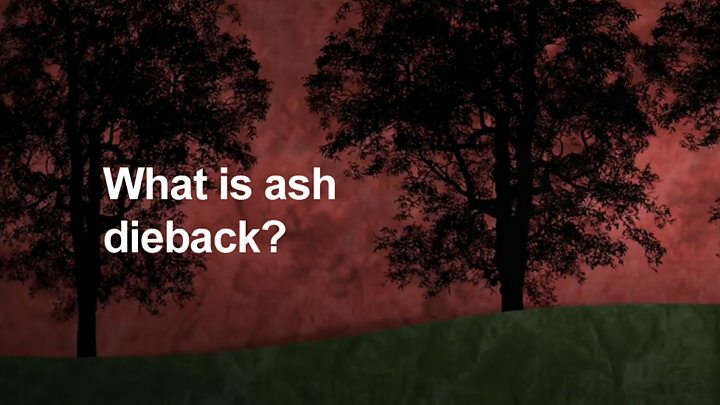 Media captionHow does ash dieback develop? A deadly fungus is spreading "more quickly and lethally" through the UK's ash trees than experts had anticipated, BBC Wales has learnt. Natural Resources Wales (NRW) warned of a "very significant impact" on the landscape. Landowners are already paying out thousands of pounds to hire tree surgeons, temporary traffic lights and other equipment to deal with the problem - known as ash dieback. One described the situation as a "tragedy". A recent survey - which split the UK into 10km grid squares - found infections had been confirmed across 80% of Wales, 68% of England, 32% of Northern Ireland and 20% of Scotland. Gavin Hogg, who owns the Penpont Estate near Brecon, Powys, said all the ash trees on his 2,000 acres (809 hectares) were showing signs of the incurable disease. It kills younger plants and weakens more established trees, making them vulnerable to other infections. He has already felled about 75 trees which were close to a main road. "We have such a massive problem we are going to deal with the public safety issue first," he said. "Instead of having a steady tree management programme we are now entering into crisis management where trees are being identified as dangerous and will need to come down." Dr Chris Jones, tree protection officer for NRW, said it was now "endemic". "We're finding it in woodlands, we're finding it in roadside trees, we're finding it in hedgerows right across Wales." He said it was important landowners - including local authorities - started to plan ahead and budget for any felling that may be required. However, for trees situated in places where they do not pose a risk to safety, the current advice is that they should be left standing in order to identify any that may show signs of resistance to the fungus. Sonia Winder of Tillhill Forestry explained that ash trees preferred deep soil and a damp climate which meant they had thrived in Wales. The company she works for manages 50,000 acres (20,000 hectares) of woodland and is increasingly advising clients on how to deal with cases of ash dieback. "I think everybody has been caught on the backfoot a little bit by the speed of the spread and the extent of it," she said. "It has spread more quickly and more lethally than we had been led to believe in the beginning. "If you've got trees that are close to buildings or schools or roads and you're looking at taking them down it can be very expensive and at the moment there is no help for that from Welsh Government or anybody else to assist with those costs." Ms Winder added that ash dieback was now at a level where it could be compared with Dutch elm disease, which wiped out the vast majority of elm trees in the UK in the 1960s, 70s and 80s. As an iconic, widely recognised species, found in parks and gardens up and down the country, she said that the ash tree's loss would have a "significant impact". The Woodland Trust added its importance to wildlife should also not be underestimated and that planting more native trees in its place should be prioritised. The Welsh Government said it was working closely with NRW to set up an Ash Dieback Awareness Group. "We are developing this group to discuss and communicate the latest research, management options, progress of the disease in Wales and the rest of the UK," said a spokesman. It is also contributing to the Tree Council's Ash Dieback action plan, which outlines ways local authorities can help manage the disease. The plan is set to be launched at the National Botanical Gardens in Carmarthenshire at the end of March.